1. Make a dressing by whisking together half of the oil, ginger, chilli, lemongrass paste, honey, lemon juice and coriander. 2. Bring a saucepan of water to the boil and add the frozen peas. Return to the boil, reduce the heat and simmer for 5 minutes. Drain and set aside. 3. Warm a non-stick frying pan over a high heat. Cook the salmon fillets for 8–10 minutes, until golden and just cooked through. Add the dressing for the last 1-2 minutes to warm through. 4. Meanwhile, heat the remaining oil in a pan, add the leek and cook for 3-4 minutes to soften. Stir in the spinach leaves and peas and cook for a further 2-3 minutes to wilt the spinach. Season. 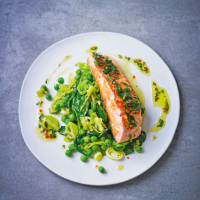 Serve the salmon with extra coriander sprinkled over, with the peas, leek and spinach.